This week Kenny and the design team have created a stunning Business Layout Pack with seven different pages that provide you with everything you need to get a professional business website up and running in just a few clicks. This business layout pack is designed to provide everything the average business will need out of the box. You will find contact info and a contact form at the footer of every page. The portfolio page and the pricing page (including an FAQ) are both great additions. 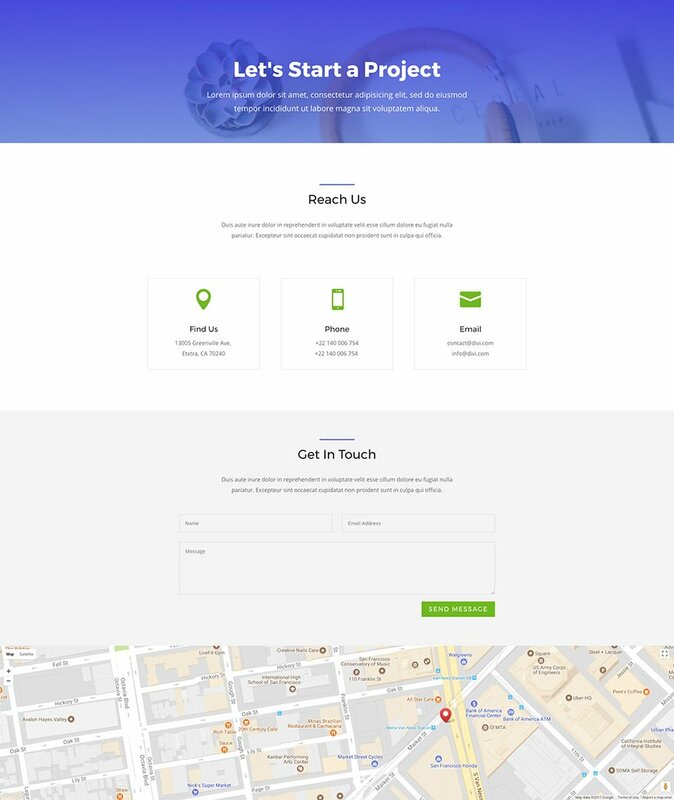 The landing page includes a fullscreen header with a double CTA along with all those useful elements like featured case studies, a pricing table, an email optin, and testimonials. 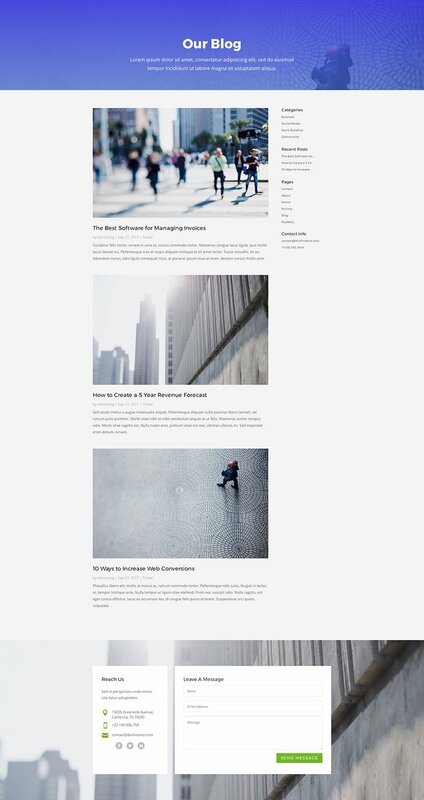 The blog page uses the blog module to display your posts in a fullwidth layout and a right sidebar. Plus, all the page designs include a great selection of photography that can be touched up easily with colored overlays to match the branding of any business. And, changing the colors of the icons, gradient backgrounds, and buttons can all be done using the color palette within the module settings. To use the Business Layout Pack on your own Divi website, you will first need to download it using the button below. To gain access to the download you will need to subscribe to our Divi Daily email list by using the form below. As a new subscriber you will receive even more Divi goodness and a free Divi Layout pack every Monday! If you’re already on the list, simply enter your email address below and click download. You will not be “resubscribed” or receive extra emails. Once you have downloaded the layout pack, locate the divi-business-layout-pack.zip file in your downloads folder on your computer. Double click the folder to unzip it and then navigate inside the divi-business-layout-pack folder. Inside this folder you will find 8 files, each of which is a unique layout that you can import into your Divi Library. To do so, navigate in your WordPress Admin to Divi > Divi Library > Import & Export. You can select the individual layout you desire or choose the All Layouts file to important everything at once. We hope you enjoy this business layout pack. And to help ensure that you do, we’ll be doing a live stream on our Facebook page tomorrow at 3pm EST to walk through what it might be like to actually use this layout for your own website instead of simply importing it and loading it up. We’ll talk header and footer design, customizer settings, converting certain sections to global, and more. Puede cambiar a cualquier idioma disponible yendo a wp-admin> settings> general y desplazándose hasta el idioma del sitio. Cambie esto al idioma que necesite. Esto cambiará tanto el idioma del sitio front-end como el área de back-end de wp-admin. Hey, for those of us working in the non-profit space, do you suggest any modifications to this theme… or is that “look and feel” so radically different that the corporate/clean-line look of this Business Layout Pack isn’t relevant? Thanks for these suggestions. They are a nice reminder to remain fresh. Where is the download button please? You enter your email address and click the “DOWNLOAD” button. One reason I’m looking forward to the built-in interface for installing them. Yes, I agree. This whole process is a pain in the neck. I am a lifetime member, and it drives me crazy trying to access these resources. Well OK, but the web site needs to be structured better to be able to find these resources. Honestly, I am not stupid, but it gives me a headache and I find myself logging in twenty times to get anywhere. Great. Going to use this on a client’s website today. Are the images already in the JSON files? Or do they need to be individually updoaded? Thanks. We are working on right now. Any specific content we should consider? This is a very nice layout pack – thank you! Guys, these look great. But please can you just spend the extra few minutes to create demos with navigation so you can view the pack as a website, rather than just having a page then having to go back here, look at another page, etc. The menu and nav is also quite a key part of the website look and feel! Tasty, tasty, very very tasty. Why do we have to reenter our email every week if we are logged in and already an Elegant Themes member? I am your follower and I love your videos and your creations, thanks to you I am convinced to take a lifetime license, now I am convacu that soon you will go out a new layout for photographers. Thank you very much for your work and continue like that. Just gorgeous. Love that you did something with the pre-footer area. Thanks! No se ha podido descomprimir el paquete. El tema no tiene la hoja de estilos style.css. Fallo en la instalación del tema. Mariano, no es un tema, es un Layout pack, es decir, un diseño pre hecho, tienes que seguir las instrucciones que hay un poquito más arriba, donde dice How To Import The Divi Layout. I’m actually re-vamping my divi website. Thanks for the ideas ET! Very nice just before setting smallbusiness layout pack of Olga Summerhayes. Are you planning to make coaching layout pack? Always something new and great from Elegant! Where can I find all of the templates you currently offer? Can they all be found in one place? Hey! I’m a Divi Member, but for some reason it’s not allowing me to download this pack. It tells me to Join to Download, so I login, and then go back to the blog page… and then it logs me out & tells me again to Join to Download. Help? I’d love to download this layout pack. I would like to know what differences in design, as well as layout, you’d suggest for charitable (501 c 3) business websites. I work with a group that helps underprivileged teens find college subsidies. So this theme is similar, but maybe not similar enough? To me, this pack looks rather corporate. What do your designers suggest as changes, modification? Thank you! I don’t see how to download this. And where can I find others like it? Simply enter your email and click download. I love this theme. Great work!! I will be changing my current Divi theme to this layout. Thank you. I got this message when I try to install: A failure has occurred. The structure of the archive is damaged. Weird. I would try downloading the layout again and updating Divi before uploading again. Another amazing layout pack. Great Job! Really nice, and this is a super-handy set of layouts for a lot of different types of businesses. THANK you! Great pack – thanks for sharing. Can we have a hotel and healthcare layout pack soon? Thanks! Nice of you to offer the images as a separate download too. Keep the good work up! 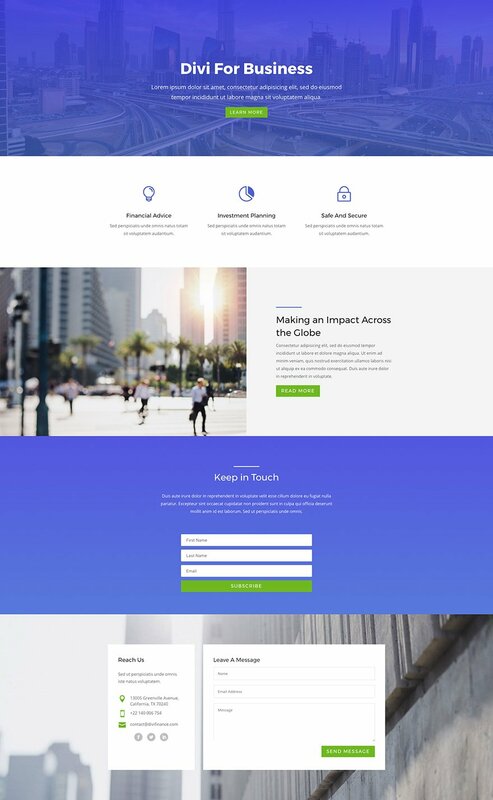 It is extras like this Business Layout Pack that make Divi such a great investment, too many other theme producers allow their themes to die a slow death leaving one wondering whether or not a theme is still being supported, Elegant Themes Divi however goes from strength to strength, better and better. Keep up the good work Elegant Themes. It looks incredibly well. Thank you! Hello and thank you for your great layout. Just some questions. First the spacing in the features sections aren’t like the demos. Button and divider are stuck in top and bottom. And also the second in row feature (with the image in the right) are not appearing. Thank you once again for a great layout and photos. Is there a Construction / building pack coming up? I mentioned it yesterday. I think its divi problem in general if you uncheck the animations in each module design in feature sections (divider, title, feature) the problem will be solved. Hiya, and thanks for the Theme. I’ve loaded it up as a working demo site and all the pages work fine except for the Blog page. Set up page, added from library and add page to menu…but click from the menu and it comes up as boring old blog setup. How do I get the lovely Divi blog page? Can I use this layout witch extra theme ? Sorry. This layout is for Divi only. Hi is it easy enough to add menu items to this layou? Yes. You can add your menu items like you normally do in wordpress. This whole pack has a viewport issue, still can’t find where. Please help us out! I really like these new business themes and will be looking at using one for one of the next sites that I put up. Thanks for all the hard work. I’m pretty new to Dive … can you tell me… do the image assets provided get populated into the pages automatically when you select a page type? These themes look great! Before I launch myself into designing my own websites, I’d love to know what freebie themes are in the pipe. Anything in the coaching/wellness spectrum? Yes, maybe it’s an idea for Elegant to make a coming soon lay-out pack page. Yes, I agree with this. I like the Business theme but it is lacking some layouts that a coaching or law firm layout might have. If those layouts will be coming soon, then I will wait for them. Otherwise, I may try to tweak this one. A “layouts roadmap” email would be helpful. J’ai téléchargé le pack mais quand je vais dans Divi bibliothèque et que je veux choisir une page, impossible, je dois tout importer à la fois et l’exportation est longue et je n’arrive jamais au bout? Thanks for this useful information shared. Hey Dominic, I actually went over that in the video. It’s just a blank child theme I created for the project. Just a best practice I like to follow but not strictly necessary. ok, so i could use any blank child theme? or none? i had defined the pages as in the video (home, blog, about…) but they were all empty except the home page. so i thought there was something missing?! Love this theme pack. Very useful. I have one caveat. This may be a Divi issue, as opposed to an individual theme issue, but when viewed on mobile devices the hero section tends to not format correctly. Or, at least, not how I would prefer. For example, when viewing the landing page on mobile forces the two buttons to stack, only they do not center on top of each other. Header copy has a similar issue where it retains the space between works when they wrap, making the now stacked copy look uncentered. Any suggested fixes for this issue would be greatly appreciated. I have tried to download it but the folder is empty. Any advice please? But when I place a logo (in Divi Settings) the logo appears on desktop. But not on mobile (Tablet and Phone) and I can’t figure out where to activate this so it shows on tablet and phone. Can you help out? This layout pack looks beautiful. However I notice that when I install it, it overrides my current theme settings, such as heading or body typeface settings, etc. So for instance, if I simply want to change the heading font throughout, it appears I have to update it within every single module in the layout on every page. This seems labor intensive and counter-intuitive. Some goes for the blue gradient overlay – it’s nice but doesn’t match my client’s brand, so I’d like to change it in one place and have it apply to all instances. Why not have those settings not be set within the modules but separately within a child-theme for instance? Or is there a reasonable way to do this that I’m not aware of? Thanks. it seems to look as intended. I spent a lot of work creating a new page, and in the end had to realize that it definitely could not be published. I am a true beginner so my hand has to be held. Downloaded the file to my documents but I can’t figure out how to unzip them so I can load them. Is there anyone out there who could tell me how to unzip them?? Is there a navigation bar? I saw that some of you had problems too. Do you know if it’s a design problem or bug? Edit : just to show you. Hi Cecile – if I understand you correctly then I think changing the top and bottom padding on the second column to a fixed measurement instead of a percentage will hopefully help you. To do this open the settings for the row and under Design select Spacing and then change the Column 2 Custom Padding settings. I changed the top and bottom to 60px instead of 6% for desktop and 45px and 30px for tablet and mobile. I hope that helps if this is still an issue for you but I suspect it will also help some other people. Which DIVI Version is needed here? The imported sites don’t look like the demo. The blue hover doesn’t appear. And the images are not the right size. And the contact form ist transparent. Do I need a few custom css file?? I’m using the newest version of Divi from the member zone. Now the theme works fine! Thanks so much!